Heavenly Father, today we pray about the landslides and flooding in Hawaii, particularly Kauai. First, Lord, we pray for anyone who might still be in danger: lacking supplies, injured or trapped in a place as yet undiscovered. Give the imperiled resourcefulness and strength to carry on. And we pray for rescuers to find them. Next, we pray for those who are trapped, yet with supplies. Give them continued courage, wisdom in how to use their resources, and peace despite this unique challenge. Lord, we pray for rescuers, who have been retrieving people via helicopter, boat, jet ski, bus, and whatever has been necessary. Give them clear minds, steady footing, stout hearts. May they bring not only rescue, but hope to those with whom they interact. As rescue operations wind down, may these brave souls find time for good rest, and may their loved ones support and encourage them. We pray for fresh water to get to those who need it as quickly and efficiently as possible. 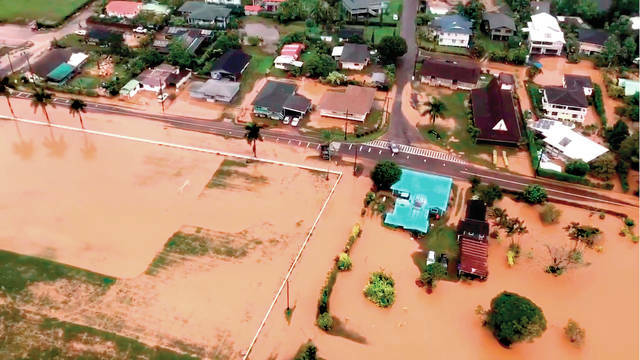 We also pray for the longer-term recovery efforts that will be taking place not only in Kauai, but also in Oahu and Hawaii, which also sustained flooding. In Jesus’ name we pray, amen.